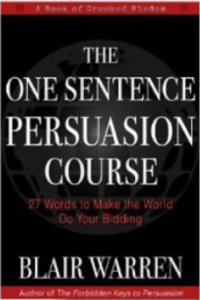 Today I read the “One-Sentence Persuasion Course” by Blair Warren. This course is very short, only 13 pages, but what is in it is very powerful. The course is sub-titled “27 Words to Make the World Do Your Bidding”. Can you believe that 27 words can persuade and influence people? I am not going to tell you what the sentence in 27 words is because I don’t want to ruin it before you have read the course. I am providing a Free download below as the course can be freely shared. How this free course can help you in your business? Well, if you are like me in Network Marketing, you will learn that there are 5 elements that you can use in combination to persuade people to join your team. I admit I was practicing 2 or 3 of them without even realizing or understand it. Now, I understand how persuasion works and the simple answer was in this 13 pages eBook. If you are not in Network marketing, this information can be used for any business.